This will take place in Rugby, with the usual format of early evening mapping followed by food and beer and chat in a local pub. We usually gather in the pub for about 8pm but depending on weather and how hungry we are, some people get there early and some later. 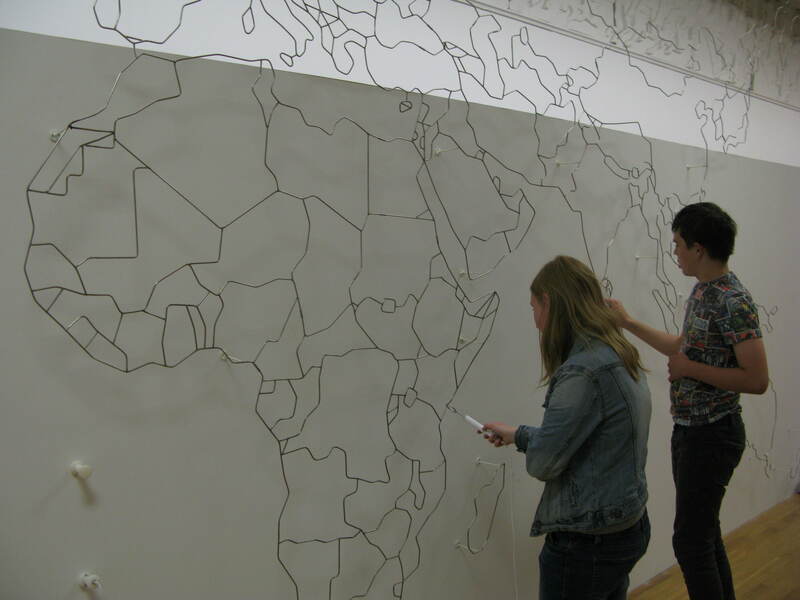 The Current Situation is a collection of work by artist Yara el-Sherbini, whose centrepiece is an interactive sculpture of a map of the world. It is large, 7.8m wide and 3.5m high with steps leading up to the rear. I saw it at its current location in Wolverhampton Art Gallery. I popped in whilst I was surveying some listed buildings (heritage buildings for readers not in the UK). The work is an impressive sculpture but its true nature is not revealed until the audience engages with it. As you can see from the picture it emulates a children’s game where you have to trace around the object with a metal implement without touching it. Here you trace around the national borders and should you touch one, red lights flash onto the sculpture, buzzers sound and the metal implement in your hand vibrates strongly. Just as in real life, navigating borders becomes a matter of tactics and skill and should you transgress the rules, alarms and shocks await you. Again as in real life, some people participate and some watch from the sidelines. It’s only when you play that the real dynamic of conflicts, dangers and exploration becomes apparent. What if no-one plays? Then the sculpture just becomes a beautiful metal map of the world, a static monument which might be seen in many public places around the planet, representing a harmonious, static view of a united world, one that is controlled and restricted. Friday saw me on a family visit to Oxford to view the Sheldon Tapestry Map of Worcestershire hanging in the Weston Library (part of the Bodleian Library). It is a magnificent spectacle, being woven in silk and wool, and standing some 4m tall by 6m wide. Although it is assumed that it was woven in Warwickshire at Barcheston, current research throws doubt on this. The Bodleian Library Map Room is the second largest in the UK and is one of the world’s top ten map collections – so it’s a must-visit for any map lover. 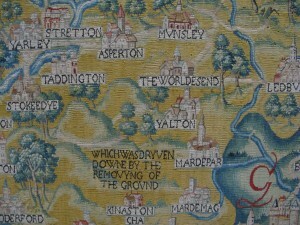 The tapestry on display is one of four tapestry-woven maps commissioned in the sixteenth century by Ralph Sheldon, a prominent Midlands landowner, based on the county surveys of Christopher Saxton. Each tapestry illustrates one of the counties of Gloucestershire, Worcestershire, Warwickshire and Oxfordshire. They would have formed a panoramic view of Sheldon’s land when hung in his home in Weston near Long Compton, Warwickshire. The maps are an important stage in the evolution of cartography. 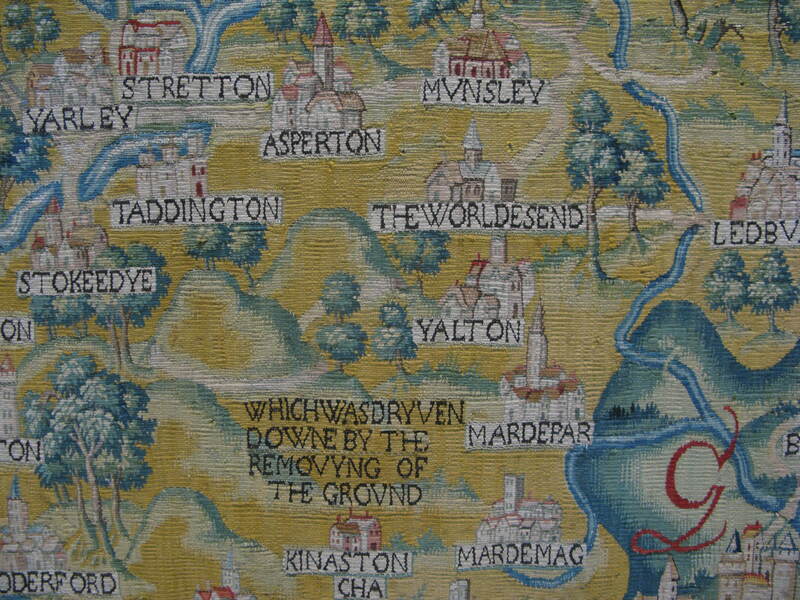 This tapestry survives in parts only: in fact the only complete one is that of Warwickshire which hangs in the Market Hall Museum in Warwick. You can see what was involved in restoring the tapestry here. There is an intriguing reference to an area “whych was dryven downe by the removying of the land” close to a placename of The Worldes End. The Guardian had a good piece about the tapestry , although the mystery of the “removying of the ground” seems to have been solved – apparently it was a massive landslide. If you want an in-depth view of the tapestries see this scholarly article. It’s good to know that mappa mercia is following an ancient tradition of local map-making although I don’t think OpenStreetMap will ever come close to the beauty and craft of the Sheldon Tapestry Maps. June 4th saw us meet at the Digby pub in Water Orton after an evening of mapping footpaths, listed buildings, shops, postboxes, addresses and well, just about anything interesting we saw -but not the detective who subjected Matthias to a stop and search , as mapper behaviour of taking notes and photos was regarded as “suspicious”! What a way for Matthias to end his stay in the UK! Good Luck Matthias back in the Netherlands and thanks for all your hard work with mappa mercia. We’ve also decided to setup a Facebook page as a way of reaching a new audience. It’s now May and the project is a month old and with two months to go, it’s time for an update. Robert Whittaker has an excellent site monitoring OSM data on postboxes in the UK. Here you can see progress (even a league table of who’s contributing). From the history graph you can see there’s been an increase in activity since the project got going. Perhaps Robert might provide some data analysis about the effect of the project. Enter a postcode and you can find all the missing and incorrect postboxes nearby. I was amazed at just how many were missing in the areas I map regularly: a great incentive to revisit all kinds of places. In doing so I discovered one of those rarities: an EVIIIR royal cypher(OSM node 448635608). How many of these are actually recorded in OSM? It would make a great treasure hunt for the rest of the project. From web research I think there are only 2 in Birmingham so my job’s done. I’ve been unable to track down some of the indoor postboxes – two in particular are indicated in Sainsbury’s supermarkets near me, but neither exists. This led me to wonder whether Sainsbury’s had some kind of agreement with Royal Mail which didn’t work out so they were removed. But you can’t build a hypothesis on two pieces of data! Does anyone have any knowledge of this? Or replicate my findings? In the West Midlands we’ve had some fun trying to locate the Coventry ParcelForce depot which is NOT where Google thinks it is. It moved over two years ago and is now mapped in OSM . Thanks must go to our local sleuth: spiffymapper. Parcel Lockers are poorly mapped – only 8 existed in OSM for the UK at the start of the project. Now there are 11 . It turns out that one of the operators, ByBox, has its national distribution centre in Coventry so time for spiffymapper to get his sleuthing shoes on again! Any other stories on what folk have been up to on this project are welcome. New month, new quarter, new project. Our first attempt at a quarterly project has just finished, where fixing road names was the target. I’m sure there was an uplift in the rate of clearing these up and a big thank you to everyone who took part, but we don’t have any formal metrics (perhaps ITOworld might do some analysis on comparable rates across quarters) and there’s still a way to go to clear the total number of mis-named roads. What is clear is that there’s not enough mappers on the ground to tackle something basic like this and we don’t have a scalable method for contacting existing and potential mappers. I guess maintaining a map isn’t as exciting as creating one! Anyway as we proceed with quarterly projects hopefully we’ll evolve how to solve both problems. Our goal with quarterly projects is obviously to improve the map in a co-ordinated way but also to try and develop the UK mapping community by reaching out to new audiences and to re-energise existing and lapsed mappers. This could be Royal Mail postboxes (still loads to do); Royal Mail delivery offices and sorting offices; delivery areas/gates to factories and town centre shopping malls; maxheights and maxweights on roads; courier depots; distribution warehouses; new internet shopping parcel lockers (see wiki entry); there’s a new parcel-collection service based around mainline stations called Doddle.it; airfreight facilities; railway marshalling yards; secure lorry parks; port/dock facilities and anything else you can think of. All suggestions and stories welcome. 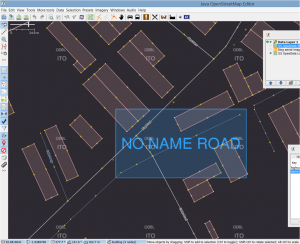 This is a mini-tutorial presented as part of the UK Quarterly Project to fix road names. There are occasions when along a long stretch of road the name changes several times. In the absence of a survey confirming that the local authority precisely defines where the name changes by placing road name signs adjacent to each other, you need some method of determining where the name changes. If you don’t have a helpful placement of road signs then a change in the house numbers is a good indication. 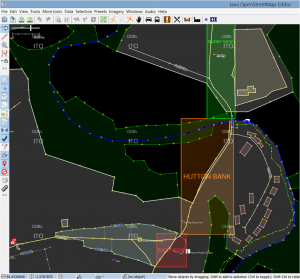 However, armchair mapping can make use of the OS Locator data layer whilst editing. In the example shown, there is a stretch of road with 3 names. The geometry of the OS Locator blocks is a good indication of where the road name changes. East Side (at the foot of the image above) shouldn’t be added because it’s already named something else in OSM and needs a ground survey, but it’s likely East Side is correct , given the nearby roads running from it, named South Side and North Side. 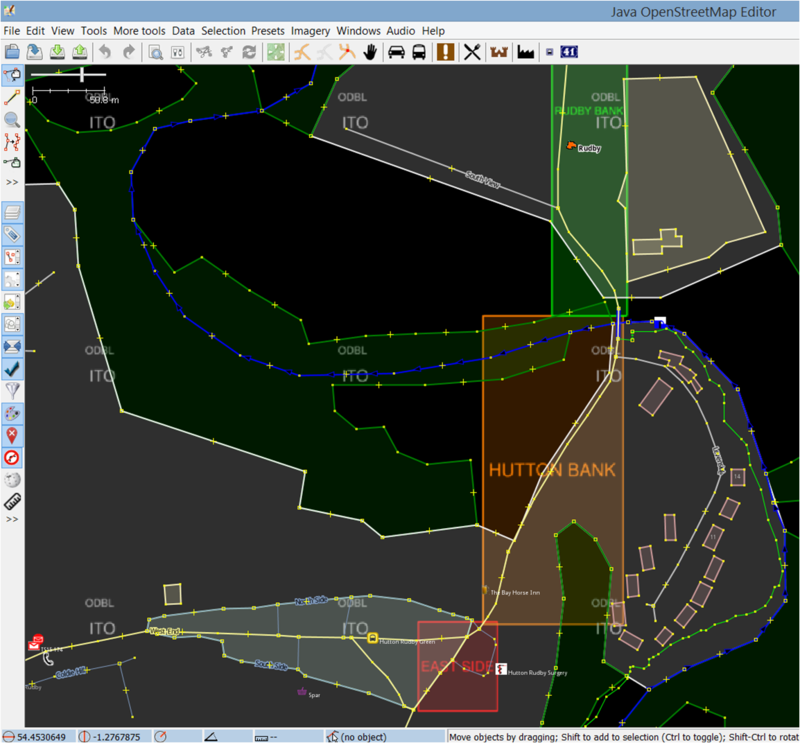 Hutton Bank and Rudby Bank can be named as OSM has no name for them. There’s a slight added complication that the road name seems to change in the middle of a bridge. So we can split the bridge and add the names up to where the OS Locator boxes indicate, not forgetting to add the tag source:name= OS_OpenData_Locator. Result: one small improvement to OSM road name data. There are occasions when the OS Locator data just throws up something that is unresolvable! Is this OS adding a sense of humour to its data? Were the staff just bored? Or is there really a road with no name called No Name Road? This has to be the special case of all special cases! OpenCage Data have featured us in their long-running Open Geo interview series. You can read the interview here. OpenCage Data is a division of Lokku. Founded in 2006 and based in London, Lokku are long time supporters of OSM – they’ve sponsored numerous State of the Map conferences, mapping parties, and made major donations to HOT-OSM and OSMF’s server drives. They also run #geomob, a meetup of London location based service devs. Opencage are best known for Nestoria, a property search engine. Thanks to all the mappers who have participated, including those not in the top 20: if you’ve only got a couple of roads left to check you’ll never appear in the top 20 but your contribution is just as valuable. Congratulations also to those who’ve got their local authority area to the 100% mark recently: Torfaen; Dover; Gwynedd; Powys; West Lothian; Wolverhampton; and South Gloucestershire. Currently we don’t know whether our quarterly project experiment has incentivised people to go out and tackle this problem or whether it would have happened anyway. Any feedback would be appreciated. At our monthly mappa-mercia pub meeting we were chatting about new ways of encouraging participation in the current quarterly project to fix street names. It seems that there are people who both contribute Notes and comment on them who might not be on talk lists nor be aware of the OS Locator data which highlights name problems. So we thought that adding Notes about road names that need fixing on the standard OSM map, asking for confirmation of the correct name might elicit some response via a comment indicating the correct name. This could then be edited by a mapper. Potentially, by using this method we would address a new audience who are prepared to add data occasionally but don’t want to be hard-core mappers. This method would work best for situations where OSM and OS Locator have different road names. We’d like to try this in an area with a high density of road name fixes and few active mappers. Liverpool, Rotherham and Manchester look to be likely candidates (258, 225 and 198 road name fixes respectively). If there are active mappers in these areas who don’t want this to happen please let us know soon and we’ll keep away. You could of course volunteer another area, either for us to pilot or to do it yourself. If we don’t get a sufficient response to our Notes we would follow up with web searches for local community groups who have twitter or facebook accounts and ask for their participation via those media.